The Atomos Shogun 4K HDMI Recorder is continuously becoming more and more popular with more cameras supporting clean HDMI signals. Instead of your camera recording to a compressed file to an SD or Compact Flash card, the feed is recorded in the Shogun to a variety of high quality formats. 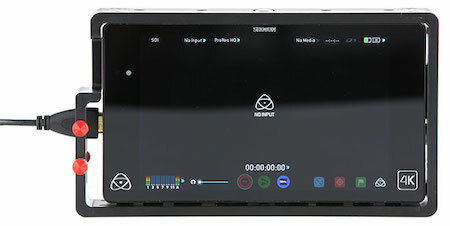 Aside from just being a recorder, the Atomos Shogun is an amazing full featured high resolution monitor with waveforms, peaking, zebras, and more. The fact that it can see a 4K signal also makes this ideal to monitor from such cameras that only output 4K where other monitors won't work. HDMI itself though can be problematic as there is no locking mechanism to keep the connection solid, and as the cable protrudes, there is the possibility of damaging the HDMI port. If you're working with the Atomos Shogun, and want to instill a higher level of confidence, check out the PVGear KavalCage with HDMI Locks designed for the Atomos Shogun. At almost $2,000 dollars, I think the Shogun's ability as a 4K Recorder, Monitor, and Audio Preamp makes it worth every penny, but it might be worth spending a few bucks more for the PVGear KavalCage system to protect the Shogun during use. Posted in dslr video. Tags: atomos shogun cage, atomos shogun hdmi lock, hdmi locking cage, PVGear KavalCage Full Metal Cage for Atomos Shogun on April 10, 2015 by Emm. 1. Make the screws for the audio block captive so they remain with the block when removed. 2. Make a sun shade that works with the cage. 3. Make a clamp or fixture block to hold the three dangling XLR audio connectors. It looks to me that the Atomos audio cable is most likely to fail right where the cables exit from the main connector. I think it would be useful to be able to either strain-relief those cables. Clamping those cables in a block is one way to do that. The XLR block could attach to the cage or become part of the audio block. Another simpler idea would be to include a slot in the audio block that would let a Velcro strain relief strap pass. This product looks like a winner to me. Best of luck with it. @Ignacio Artinano - Not the stock sunhood. You can mount an 8" LCD Hood over the whole frame if you wanted to. Nice Cage, but just one question about the Atomos Hood. Is there any possibility to mount it over the Cage? @Adam Jeal - Not the stock Atomos sunhood, but any 8" one should work. I have the atomos sunhood,but have yet to use it. The monitor is fine outdoors for me. Is it possible to install the Atomos Sunhood for the shogun over this cage?